Our LED Downlight is for both new and retrofit construction, designed with 5000K daylight color temperature and 90 degree beam angle. It delivers an extraordinary lumen output with a very high Color Rendering Index (CRI) 80+. This light features in 1%-100% smooth dimming, instant on and widely compatible with most LED dimmers. You can easily adjust the light brightness to suit your specific need and ambiance. 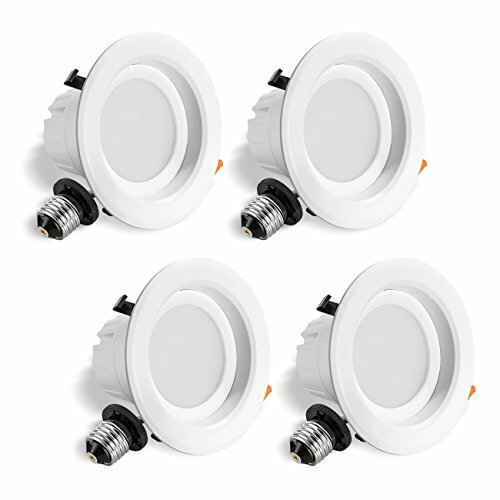 Integrated LED recessed downlight with standard medium E26 screw base adapter enables you to enjoy a fast, easy and secure installation with quick connector. High Efficiency: Give off lighting 750 lumens and designed with 5000K Daylight, super bright. 90 degree beam angle lighting, 80+ high color rendering indexes, making it so brilliant as sunlight. Energy Saving: Reduce over 85% on your electricity bill replace 65W halogen bulbs by 9W LED recessed lighting. 25,000+ Hours Lifetime: Ultra-durable (equivalent 12 year with 6 hours/day), along with 5-year warranty, highly reduce frequency of replacing light bulbs. Widely Dimmable: Smooth dimming from 100 to 5 percentage, without flicker and buzzing, also compatible with most household dimmers, meeting your various lighting needs. Easy Installation: Comes with E26 base adapter, fit most 4 inch metal cans for retrofit installation.Ideal for all recessed lighting applications- from new construction to retrofit as well as commercial to residential settings. If you have any questions about this product by LVWIT, contact us by completing and submitting the form below. If you are looking for a specif part number, please include it with your message.